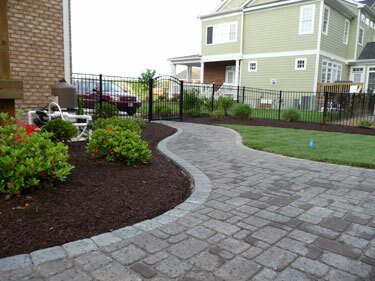 Pavers were used to create this backyard walkway. Different sizes and colors of pavers can be used to create an extension to your existing patio. Shown here is a Flagstone Retaining Wall that was used to raise a flowerbed and to neatly hold in mulch. Designing an outdoor kitchen or living area for your landscape design requires careful planning. Today’s designs are much more elaborate than the traditional outdoor grill and a picnic table and there are many things to consider to ensure a living area that is both functional and attractive. Building outdoor living spaces extends your home, effectively adding on new 'rooms,' ultimately adding to the value of your home.